It used to be that unless you lived in Bali, owned a sauna or were one of those hardy, cold-water types, an outdoor shower was about as appealing as flip-flops in arctic Russia. But it’s time to reconsider: global warming is getting our days hotter—we’re growing accustomed to sporadic week-long heatwaves; our gardens are increasingly serving as extensions to our homes as we become squeezed for living space; and the more we travel to exotic climes, the more our homes, for better or worse, are reflecting the tropical, Ibiza-in-the-suburbs vibe. Above all, though, there are few things more pleasurable, invigorating and fun than showering under the sky, a soft breeze on your face. 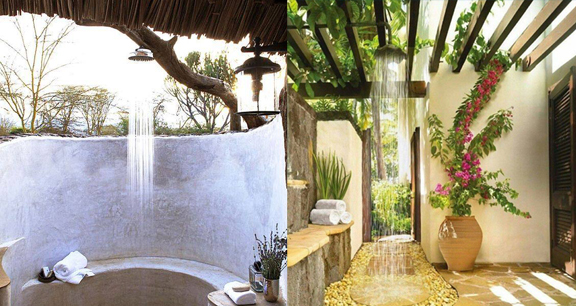 The first question is where to put your outdoor shower, and that often relates to use. Is this going to be a shower right next to the house? Off in the garden? By the pool? Most locations are workable. The choice just affects how you’ll run the piping, which most of the time can be tied into your home’s existing system. One needs to plumb the water out from some part of the house through the wall. Or it could come out a bathroom or kitchen or somewhere where there is accessible water on the inside of the wall. Location, of course, goes hand in hand with privacy. Not every member of your household, or every guest, has the same level of comfort. To ease fears about who can see what, look for sight lines from second-story windows or neighbors’ homes, and taking into account the surrounding environment. 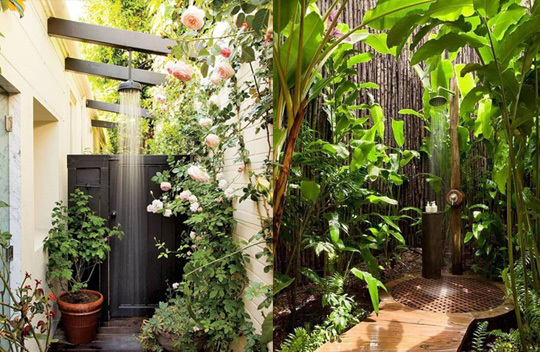 You could locate the shower near a garden or, overlooking trees and then put a little window in, one that you can see out of but that neighbors can’t see into. Materials are another consideration. PVC, the hard plastic polymer polyvinyl chloride, is always the easiest option, though be warned that it is not a long-term, ultra-permanent material. That takes care of bringing the water in, but what about getting the used water out? In a more urban site, you could connect the drain back to the septic line in your house. If you’re building the shower against a wall of your home, consider installing marine-grade plywood beneath the exterior of the house to prevent rotting. If your home is already built, layers of sealant will do the trick. As for the shower itself, resilient hardwoods like teak, cedar or mahogany work well. And be sure to build the shower enclosure and platform to allow for air flow—by spacing the slats or leaving a gap at foot level—so the enclosure can dry. As you’d expect, mold and odors do not add to the idyllic ambience. Once the basic fittings are in place, the fun can start–styling your shower. For a surf shack feel, try weathered tree trunks for seats, scattered sea shells, painted clapboard and corrugated iron. A bamboo screen and pebbles underfoot lend a touch of the tropics. Towels can be draped over wooden tables or hung on trees. Or, for the truly creative, paint a reclaimed oil drum and cut a door in the side. Showering will never be the same again.